The rumble of trains passing through Emporia was punctuated by rolls of thunder. My phone glowed on the nightstand: 3 a.m. An orange Accuweather notification flashed on the screen: “Emporia Kansas Weather Alert - Severe Thunderstorm watch.” I tried to go back to sleep. Impossible. Gradually the lights in the Gufler Mansion flickered on and we all began to descend the stairs to the dining room. 4:30 a.m. Fifteen of us stared out the window, watching the lightning and listening as the thunder grew louder. I tried to eat my oatmeal. The radar showed a huge line of thunderstorms stretching from Wisconsin. We silently prepped our bikes in the garage as the wind twisted the trees outside. The temperature was dropping quickly. Pedaling in the darkness to the start line, flashes of purple electricity illuminated the street. Ten of us were riding the full course and we had three handling support. What were we doing here? 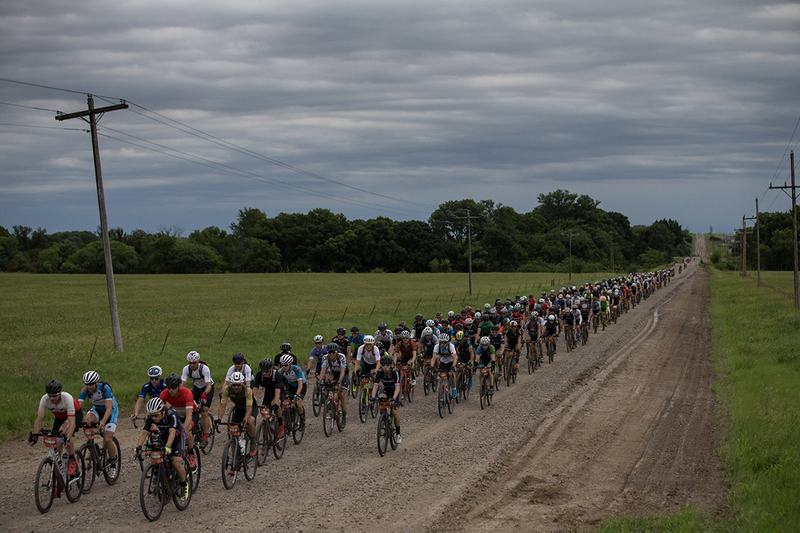 A 206-mile race is hard enough, let alone starting it in a thunderstorm. I was glad I wasn’t alone. We began to line up outside the theatre in downtown Emporia. After a sweltering day Friday, Saturday felt strangely cold. Goosebump cold. That was positive. At 5:45 the race director announced there would be a 30-minute delay to allow the storm to pass. Now we were lined up with 45 minutes to kill. No one wanted to give up their starting spot, and as the wind picked up and drops of rain began to fall we stood stoically with our bikes. The drops grew larger by the second. The wind blew harder. Enough was enough. We abandoned our bikes where they stood and ran for cover under the awnings of Commercial Street. Would I finally get to see a tornado? The storm ended as quickly as it began. No tornado. The clouds parted as the sun began to rise. How much rain did the course get? Was it enough to settle the dust? Would we all get stuck in the sticky dirt? There were horror stories from previous years of muddy starts: derailleurs ripped from frames, catastrophic failures. Months of preparation and training can go out the window 200 miles short of the finish line. 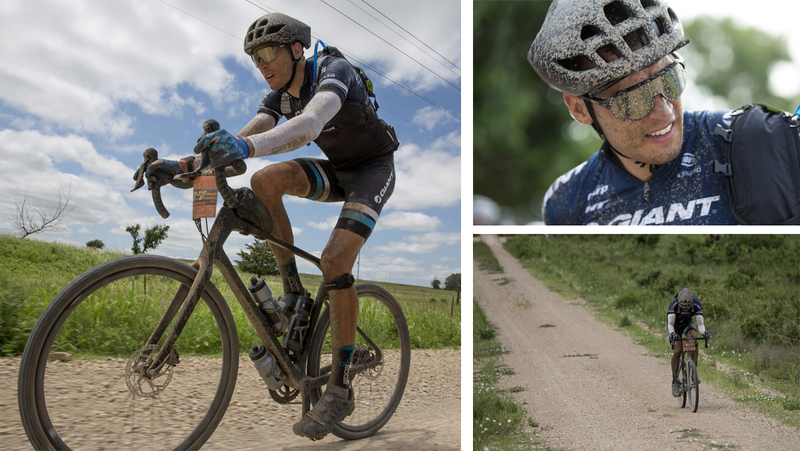 It’s all part of the gravel gamble and the mystique of Dirty Kanza. We finally started, gliding out on the wet pavement. When we hit the first gravel, the dirt was perfectly tacky and fast. However, each subsequent turn offered a different road composition. Soon, dirt bullets were shooting off treads, peppering riders with bits of rock and clay. To my right a rider bled from a large gash under his eye. “Took a huge rock to the face,” he said nonchalantly. “You’re really bleeding,” I stated obviously. “Yeah, I know.” He was unfazed. We pedaled on. We weren’t even 10 miles in. Large limbs littered the road from the storm, completely invisible to the peloton. Someone tried to call one out but it was too late. Explosions of wood and bark sent sticks into spokes and twisted derailleur hangers. Riders started to go down. We pedaled on. On gravel there are several different line choices: you can stick in one of the three smooth, tire-packed sections of road and suffer the accordion effect of three separate pace lines, or you can take a risk and try to work your way up in the loose gravel on the outside. Hissing tires and sprays of sealant signaled those who were getting overly confident in their passing strategy. By the time we hit the rolling flint hills, the field had begun to separate. Loose climbs and steep descents were made more difficult by the inability to see more than one foot in front of your wheel. I opted to hang back a little and keep my eye on the terrain. It was also the first chance I had to look around. The sun was rising over the emerald fields as a pack of horses ran next to us trying to keep pace. It was magical. I turned around to watch a line of riders stretched more than a mile behind. The pace was fast. Too fast. I had no business riding like this was a 50- or even 100-mile race. But it’s easy to get caught up in the excitement when your legs feel good. At mile 20 we crossed a shallow rocky creek and a few seconds later I felt the unmistakable squirm of the rear wheel. “Flat!” I shouted and I raised my hand and pulled to the side mimicking the dozens of other doomed riders I’d already witnessed that morning. It was a sidewall puncture, an inconvenience so common that five of the seven riders in our group had suffered one on their pre-ride a few days earlier. “C02 would be amazing!” I answered. He stopped and tossed one in my hands. We’re on gravel bikes…on the gravel. Made sense to me. My protoype Giant bike felt amazing. More flint, more climbs, more loose descents. Several other riders in our group flatted out or were dropped. We hung around six strong. By the time we rolled into aid station two at mile 100 it was getting hard to hold wheels as my energy and enthusiasm dwindled. We passed Jens Voigt who was casually spinning along looking amused. “Having fun?” I asked. “Ya, this is great!” Ever the optimist. The clock read 5 hours and 44 minutes. After a quick stop it was back out on the gravel. The wind was picking up. I left the aid station by myself instead of clinging to a wheel. Big mistake. Ten miles ticked by slowly. The cramps set in. Debilitating cramps. Eighty miles left. My pace slowed and turning the pedals became more and more difficult. One Charley horse after another shot through my hamstrings. I kept counting the miles until the next aid station where I was planning to gorge on PB&J and pickle juice. Mentally I was in survival mode now; it was no longer a race. I began to chat with the other riders who pulled alongside and then disappeared as I tried and failed to hold their wheel. There was commiserating. I came across Jake Wells, last year’s runner up, a shell of his former self. Every turn brought a headwind. Every climb provided views of endless stretches of gravel roads. I tried to look for the beauty. A few knee-deep creek crossings brought respite from the heat. Occasionally a thick grove of trees provided shade. It was beautiful. Eventually I limped into the third aid station. I’d just completed the last 55 miles in slightly less time than it took me to do the first 105. 45 miles to go. When I got to our tent the crew went to work lubing the chain, filling my Camelbak and changing bottles. They were amazing and so upbeat. I tried to eat as much as I could without getting sick. Two other members of our group were also sitting down, glassy eyed and demoralized. “We went out too hard,” they said almost in unison. We made an agreement to get each other to the finish line. We’d work together and we’d make it. It was the most optimistic I’d felt in hours. Eventually we got to our feet, threw our legs over our bikes and pedaled back into the wind. It was agony. The speed hovered between ten and twelve miles an hour as we struggled to make ourselves invisible to the gusts. We’d rotate, trying to take turns as one of us would get a burst of strength while the other struggled. I could barely hold on. Miles and hours ticked by. The sun began to turn a deep gold on the horizon. “Just finish,” I kept repeating. Then, I began to pay attention to something outside of myself. The last 20 miles were dotted with local spectators and I began to understand what this event was about. Entire families sat out on lawn chairs cheering on every passing rider. It was a beautiful summer evening in the prairie. They’d been there for hours and would be there well into the night. Some had coolers and were handing out bottles of water. Others rang cowbells. It didn’t matter if you were first, 10th, 100th, or 1000th. Finishing this race was all anybody cared about and the town was there to help you accomplish that, determined to provide you with all the encouragement they could muster. My grimace almost turned into a smile. I was suffering, but I began to think about the riders who would be out there for over seven more hours. What were they going through? What kept them turning the pedals for over 20 hours that day? They deserved the most credit. For another delirious minute I felt like I won, and in a way I did. There are no losers in a gravel race, that’s the whole point. It’s a physical and mental test, a state of mind, an event designed to challenge riders as well as the whole notion of racing. It’s not about a podium shot or an age group victory. I sincerely hope it stays that way. It’s about working together as riders and as a community to remind each other why we started riding bikes together in the first place, and why we continue to love this amazing sport. 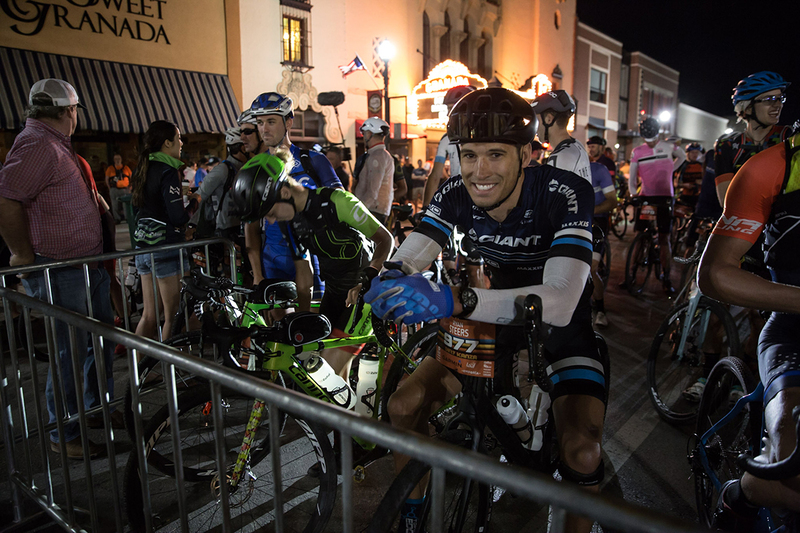 As we left downtown Emporia shortly after midnight, a steady stream of riders passed through the finishing shoot. Every rider got the same hugs, high fives, and heartfelt congratulations that the leaders had experienced eight hours prior. Riders would continue to come in for hours and the crowd wouldn’t diminish until the last rider crossed the line. Dear Emporia: Thank you for humbling me and reminding me why I love gravel. See you again…eventually.